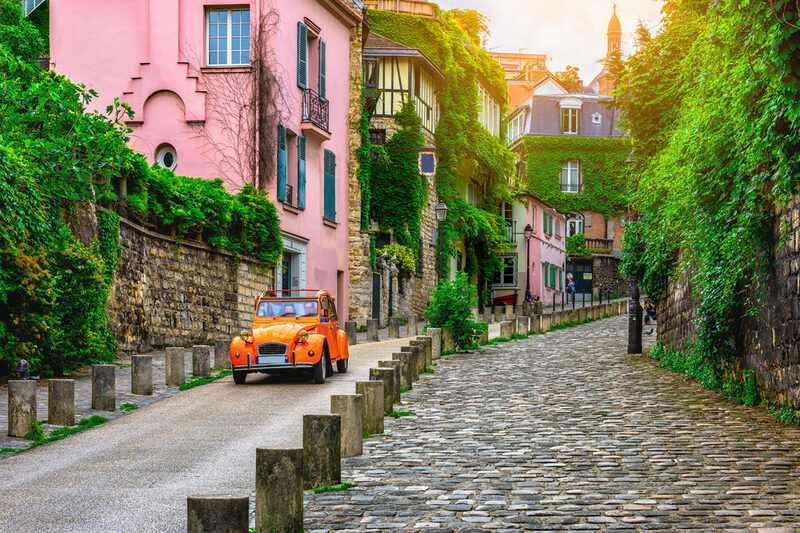 Montmartre is one of the nicest areas of Paris for a pleasant walk. With its steep alleys, panorama of the capital and good restaurants, the butte de Montmartre delights tourists and locals alike. Let’s take a closer look at the must-sees in the vicinity. This emblematic basilica is located at the top of the butte Montmartre. White and elegant, once inside you can gaze upon its vast mosaic adorned ceiling, and visit its crypt. At the very top, the dome offers a superb panorama of Paris. Bursting with onlookers and street performers, the stairs leading to the Sacré-Coeur are filled with life and entertainment. With its unique views of the city of Paris, it’s a great place to take a break and catch your breath after climbing the hill. Located a few streets from the Basilica, the Place du Tertre is an iconic square in Paris. Throughout the day, artists take turns painting unique and colourful works of art on the median strip. Even though place du Tertre has become quite touristy, it remains an incredible place to visit if you’re in the vicinity. This atypical mural is located on the place des Abbesses, just below the Sacred Heart. It consists of the words “I love you” written 311 times in 250 different languages. It attracts the area’s sweethearts who like to capture the mural with a selfie. The famous cabaret, which needs no introduction, is a true symbol of the district. Home to the cancan, the shows have been have been selling out for over a century. The Moulin Rouge has however, managed to keep its authentic soul, despite its huge success. Book in advance for the chance to see an unforgettable cabaret show. Located at the top of the hill, the musée de Montmartre is the ideal place for diving into the history of the district. You’ll find exclusive work by artists who lived in Montmartre. Need help organizing your stay? Aloha Hostel answers all your questions!